We cannot live alone… And the thing that made this moment possible for you and for me, has been brought about by many people whom we will never know. On April 9, 1939, seventy-five years ago this week, Marian Anderson performed an outdoor concert at the Lincoln Memorial. Her concert was there because she was banned by the Daughters of the American Republic (DAR) from performing at Constitution Hall because of the color of her skin. There was a “white-artist-only” clause in the contracts presented by the DAR. While there was a segregated section for black audience members, only whites could appear on stage. The news of Anderson’s situation became public, and Eleanor Roosevelt resigned from the organization. However, the public outcry did not change the policy. The executive secretary of the NAACP, Walter White, proposed that Marian Anderson should perform at the Lincoln Memorial. Franklin Roosevelt assigned his Secretary of the Interior, Harold Ickes, to oversee the logistics of the concert. Few could have guessed that 75,000 people would attend the concert, and millions of Americans would listen to it on the radio. Genius draws no color line. She has endowed Marian Anderson with such voice as lifts any individual above his fellows, as is a matter of exultant pride to any race. The first song that Marian sang was “America”. In the third line, she changed the words, “of thee I sing”, and she replaced them with “to thee we sing”. In 1942, Marian Anderson did receive an invitation from the DAR to perform at Constitution Hall. On January 7, 1943, she sang to an integrated audience at a benefit for the American Red Cross. While much has been written about this event, there are two books that I highly recommend for our students. 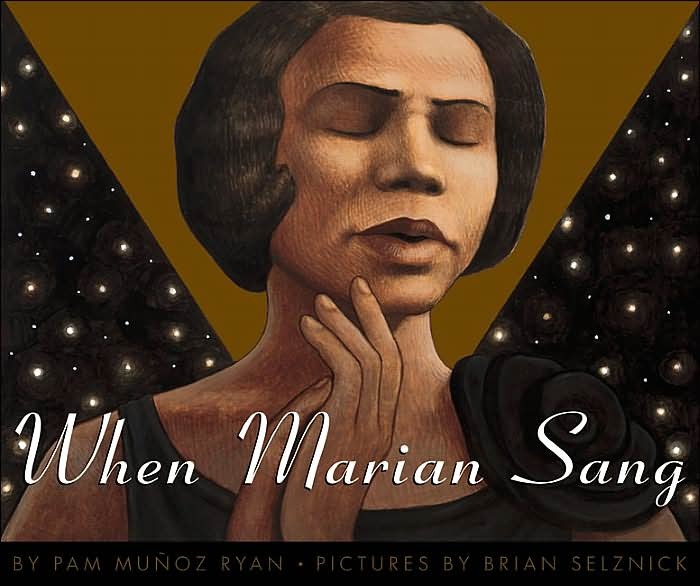 When Marian Sang by Pam Munoz Ryan, illustrated by Brian Selznick (Scholastic, 2002) is a sophisticated picture book biography. Voice That Challenged a Nation: Marian Anderson and the Struggle for Equal Rights by Russell Freedman (Clarion, 2004) is a title that I would suggest for grades 5 and up. Freedman included many photographs to support his work.